I know Daniel Schinasi through his paintings, his colors, his history, and his poetry. Some of these works are with me at work and in everyday life as they were generously provided to be hanged on the walls of my office and the Embassy’s Residence. I am a tribute to the life and the man, but also to the history of Italy, homeland beloved by the artist and that of Israel, another country of his heart. The paintings exude vitality of Schinasi, between a classic beauty, the movement of Futurism, the enthusiasm for modernity and a message to universal values. These paintings are full of light, that capture the same time a fleeting moment of life and the meaning of his eternity. Works that are immortalizing a place or a gesture of everyday life, that give us portraits, objects, landscapes, and details as if they were part of a feeling, with the ability to transform common elements in real art. I am therefore delighted that the Italian Institute of Culture and the Israeli Opera they wanted to pay homage to the eighties years old of the Tuscan’s artist with an exhibition dedicated to the bicentenary of Giuseppe Verdi, of which the artist has passionately dedicated. It seems nice, therefore, that the exhibition is opened on the evening of the First Traviata in Tel Aviv. It will be particularly meaningful to celebrate a beloved musician in the world through the works of a painter capable of being loving and understanding and at the same time decidedly inclined to translate into light, color and shapes visual movement often the abstract language of music. I thank the artist who through his tireless work and his generosity continues to give this experience, but also his daughter Sarah that promotes it with contagious enthusiasm, and all those who have wanted to collect his message to Israel, first Director Institute Dr. Carmela Callea and the Superintendent of the Opera Israel Hanna Munitz. My best wishes to Daniel Schinasi, Viva Verdi, Viva Italy, and Israel. In the World of Artists, it is never easy to compare the two of them. There is always uniqueness into the paint style, dimensions, expression of the feelings, space and color. The two artistâ€™s relations to the past and expressions of the present can never be the same. With all that said, we still would like to make an attempt to draw some similarities in the work of two great artists of our time: Marc Chagall and Daniel Schinasi. A young Russian Jewish boy left the village of his childhood to go to St. Petersburg to follow his dream of being an artist. Driven by the great strength of his people’s suffering, he went to Europe for a better opportunity to express the calling of his artistic soul. Marc Chagall always kept the pity of the exodus as an exile of the Jews in his memory. It gave him great strength and tremendous power of expression in his art. Cesare Lombardi, the editor of the Chagall’s exhibition catalog at the International Center of Brera (Milan, 1972) writes:“Chagall’s’s work is a poetic metaphor of life, born from his spontaneous imagination, moved by the matter of his affection and memories, with the grace and lightness of his creativity. Chagall’s strength is in his memory, his emotions and their ability to bring us to the past, to the Eden promised by our faith. The peaceful innocence of exposed feelings and shapes and the great transfiguring power of their original features are presenting dimensions of the great artist. His maturity, which occurred in France, was infused by a large emulation of his contemporaries: Matisse and Picasso. It led him to extol the freedom of color and space according to the impulse of his feelings. His imagination allowed him to displace the images and create the story in a variety of plans, and be intrigued by moments of time. If you look at his art, you will see that all of if his images: the villages, the temple, the bride, the animals, the violins, the candles, the flowers were evoked with the enchanting power of a deep Love. That kind of Love makes an artist’s statement in the World. Daniel Schinasi’s art bears a striking resemblance to Chagall’s but has its unique qualities. Overwhelmed by his own memories, yet being fully aware of his people historical past, Schinasi implements his knowledge into powerful images, which are easily acknowledged as a representation of the present. For Schinasi being a Jewish artist means much more than just a recovery of his childhoods memories of Alexandria exodus and exile in Europe. It is more of being aware of his religious reaffirmations, being one of the people who is struggling for their freedom and their future, trying to express power of the mankind, the bearer of universal civilization. Schinasi’s paintings do not allow you to abandon reality through unconscious dreams, symbols or allusions. His great strength is always in a clear correspondence of expressive rationality and a dynamic realism of represented life. His works are depicting a variety of compositional techniques in oil, tempera, pen, pencil, and pastel. His various scenarios are rich fields for appreciating history and life. Some of them are inspired by religious and biblical themes and are pervaded by Schinasi’s deep spirituality. They send a message on how to use the truth of the past in our everyday experience. And some of them simply claim the power of the color expression, freedom of painting concept and the symbolism. Despite the difference between Chagall’s and Schinasi’s styles, in the way they feel and paint, how they structure the space and free up the color, there is no doubt that the two artists have a deep relationship of thought and affection, coming from common roots of humanity and their strict religious upbringing. Spiritual and deep concerns prompted both of them to search for a liberating result in their art. Chagall happily arrives at the result through the dream and memory. Schinasi is characterized by a more deliberate conscious self-affirmation in the present, trough the strong charge of its dynamism, which translates into a fiery moral force. Schinasi’s historical memory is active because through his art he brings past to the present. He greatly honors the martyrs and the persecuted, the victims of all violence and the Nazi-Fascist massacres. He never forgets his roots and reminds us, that the Jew is no longer “The Crucify Jew”, but a man among men, with his dignity and his freedom and common values of mankind. Schinasi’s work “From darkness to light”, 1998 (70 x 65cm) is fully expressive of human feelings and poetic inspiration he addresses to people of Israel. On the light-infused background of the City of Jerusalem, in the harmony of nature and landscape, peaceful farmers of Israel work in fields full of crops, fruits, and flowers. This painting is full of energy, air, and light shows simple men, captured by the enchanting dream of a bright future. It is a triumph of colors: yellows, reds, a blend of blues, with the slight hints of reading between earth and sky. White doves represent auguring transition from darkness to light, still being doubtful of the bright future. Schinasi’s work is an exemplary statement of high spirituality, inspired by the reality of Israel; its historical past and present. In the history of art of the second millennium, Daniele Schinasi exercises his role as the heir and successor of the great Marc Chagall. As today’s artist, he is also a serving cantor of the Jewish world and humanity. David Cassuto does not have the need to explain who is Daniel Schinasi whose works is so humanistic and personal, whether special or monumental works and painted walls, present themselves. In this exhibition (note: Jerusalem, 1998) that that is highlighted is a less known Schinasi, the Hebrew. Schinasi, which is an international artist that spans different cultures unexpectedly reveals a faithful son of his people, sensitive to Jewish suffering and admirer of the renewal of Israel’s his land. Not all his works of Jewish entity are presented here, but it is worth remembering the “Sacrifice of Isaac” (1991) as a symbol of the suffering of which Daniel Schinasi witnessed the Holocaust. This sensitivity to the sufferings of his people assumed frightening expression in his “Homage to the victims of the Holocaust” (1985 – 1986) or in its “Jacob wrestling with the angel”, which express the Jewish rebellion against his terrible fate, or in the opera “The angel announces the liberation from death camp” where it seems that God wants to apologize to the chosen people for the tremendous suffering. Other works express love for the land and the people of Israel, to Jerusalem and its inhabitants through representations a part of open landscapes and city architecture by ATRA of touch old. He also sees the holiday of Chanukkah as a symbol of the light that awaits the people of Israel in the future. Schinasi, it is also involved in small sketches of his brothers, such as the ‘grinder of the ghetto, The Jewish baker in Pitigliano, and many others. There is no doubt that this exhibition reveals a new synthetic and unique Daniel Schinasi that until now was hidden inside the folds of the great Daniel Schinasi, and we can only welcome that. Evidence for Neohumanism of Schinasi. As a scholar of Futurism, since the second half of the Fifties, it was destiny that eventually I would meet with the painter of “Neocubofuturism” Daniel Schinasi, from Livorno, but settled in Nice for many years. If I write only on this occasion is a coincidence, since I knew him, and immediately appreciated, from his work back in 1977 on the occasion of his private in Rome. I must say that I never had much sympathy for instinctive situations of alleged continuity beyond the inevitable conclusion (historical) art movements of the “historic”. I remember for example Futurism revived by Enzo Benedetto in Rome, from the sixties. It was natural that future historians who in his youth trying to come back on those experiences as well as its maturity and old age, trying to claim a continuity through a time. But if you go there – as in the work of Osvaldo Peruzzi, who urged the young Schinasi – this belongs to a creative story entirely their own, and so this actually counts as evolutionary, that is sufficiently different. And then you put as a value beyond the youthful experiences, tied to a historical movement ended, and she puts them into a personal perspective that is historical precisely because evolutionarily made beyond these experiences, while maintaining its own with these intimate dialogue. I have not got much sympathy for the intentions of young people in the bench a “new future” as the group maintained between the eighties and nineties from my friend Renato Barilli, and that in reality have never appeared interested in imagining a future, but only to interpret, and quite currently, their present. Schinasi’s case is different. 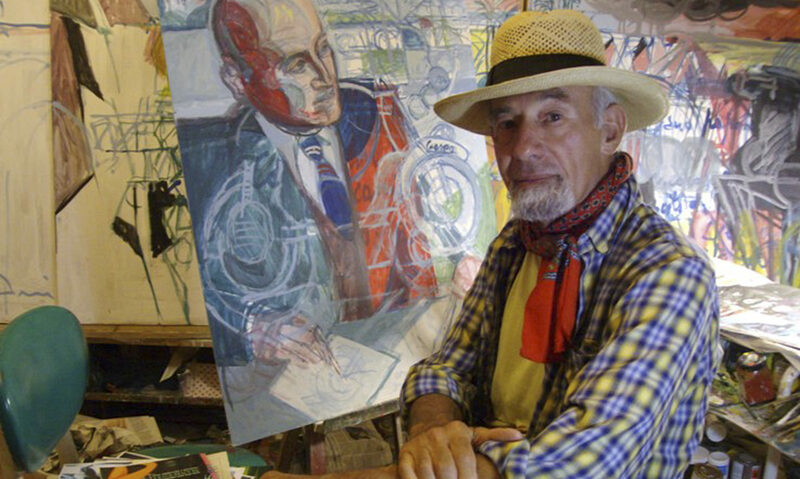 Is born in 1933, just a month after me, and he is a Neocubofuturista painter, as I am a scholar of Futurism. Retrospectively his “Neocubofuturism” is a personal matter, is the label that he preferred to distinguish their work, the reality of which, however, is a research dynamic pictorial depiction of reality, or – if you will – of figuration in the interests of intrinsic dynamism understood as the reality principle. Then his dynamic vision of reality is configured using the principles of analysis decomposed hints, especially the summary, with sympathy towards the solutions that were at the time of a typical dynamic of Boccioni figurative influence, the quality and ways of his painting. Which in fact did not nostalgia, but manifests only a lineage that goes back to the area of training of Cubism and Futurism Ten years of the Europeans in particular. But no one could ignore the fact that the painting of Schinasi are also clear influences post-synthesis Cubist, as it circulated in Europe between years according to forties and early fifties. Schinasi’s painting is in fact a reality with which to compare the peculiarities of his manner, his confidence in the car as a pictorial representation of the real capacity, quality of paint to do that on this trust is based, and in his perception of dynamism as provided closer to the sensibility of our time, with the idea that historically it about the second half of the twentieth century, and bears the legacy in this glimpse at XXI. It ‘a painting that, since when I met her, I was struck by an intimate penalty, which had already suffered since confirmed by the intense and almost hard work in the plan that preceded it. In 1960, his painting was strong of matter, tending to synthesis art. But already in 1962 is there an emphasis on synthesis, which does not yet use dynamism of Futurist ancestry, but rather a simplification of the image for large planes of color, that if ever ways echo synthesis figurative post-cubist still circulating in Italy ten years earlier. the use of dynamic ways of decomposed ancestry futuristic, post-Boccioni, Schinasi arrives soon after and along the Sixties, and just pressed through a preliminary exercise in design. E ‘research that deepens in the seventies, and which became and still is, the basis of its appearance. Which is addressed to issues of social life, work is farmer worker is, on sporting occasions. In the work of Schinasi we discover a substantial vein of painter brief narrative and the major narrative complexity reach in the various murals made between the seventies and nineties ). In this sense, feeling he was capable of a dialogue with the Italian Renaissance tradition. Schinasi is a man of many experiences, in Europe, but his world is basically tied to a finding of social life and popular coast, from the Maremma and the French Riviera. His vision of reality is dramatic, and therefore inherently dynamic but largely positive, since it expresses a confidence in life, no future but currently, even a vision of life which expresses the roots of the vitality of the people. And in this c ‘is an instinctive and yet very conscious intention of reaffirmation of values, opposing the easy lure of consumerism and technological innovation, and looking instead to the human sphere, but now old. Perhaps the positive vision of Schinasi says its penetration through light – and in more recent paintings also aggravated coloring – that pervades his dynamic vision closely. It manifests itself mainly in a defense Neohumanistic. Schinasi is a loner, as it should be. His painting proceeds from the early sixties according to its own internal evolutionary line, without jerks, without jumps, with an inner confidence in the car and humans, and personal results of undoubted quality. In March 1995, my friend Jacques Lepage, poet and essayist, proudly wrote about Daniel Schinasi: “The pictorial work of this Italian Tuscan artist possesses the rectitude, progression, and enrollment into an almost heroic act of asserting the deep human context”. Despite the boldness of his style, Schinasi endorses all major acquisitions of this century, taking his own stand on modern issues. It is no accident to me that Schinasie’s work is the most meaningful art since Cubism and Futurism. Daniel Schinasi’s paintings are always in motion. They often appear as they refuse death itself by putting into action the machinery of our very existence. This is strictly Schinasi’s style. By all definition, his work appears to be one of the leading forces in the modern art world, as universal suggestion that the life is an action that never vanishes. Schinasi makes shape and color closely related, combined shall I say. Nonetheless, the action also appears to be on hold on some of his paintings and drawings. Schinasi is able to create landmarks, havens of silence and reflections before he moves on. After his student years when he was heavily influenced by the pictorial and sculptural art of Renaissance Artists, and especially, by Leonardo Da Vinci, Daniel Schinasi was able to create his own style which had renewed what seemed to be rigorously established at the time: the Cubo-Futurism. He renewed it by matching the shape and the color, by creating new perspectives and unusual sounds of color waves: a transcending orchestration, as I would call it. Schinasi’s research of a very new artistic concept had given him some challenges and demanded a certain amount of a heroism. It seems to me that he won the battle, despite the inevitable reluctance of some critics who tend to have sectarian views on the evolution of the contemporary art. Daniel Schinasi uses principals of Cubo-Futurism in his work as an attempt to transform the human social order and to illuminate its prospects for a better collective living. That’s where comes in the beautiful light, that bright substance that floods Schinasi’s art. I would call it: “The Generosity of the Singing Light”. Author of many achievements, the Tuscan artist Daniel Schinasi addresses dimensions of the wall art beyond the suggested subject. He is able to live and knows how to continue to live through the architecture of his paintings, mentally framing the civilization that honors his work. Schinasi Daniel was born in Alexandria, Egypt in 1933 by the family of Sephardic Livorno origin. From the ’50s moved to Europe, continues for more than thirty years his pictorial research that the early post-Impressionists came to the formulation of the principles Cubo-futurists. The problems of injustice, violence, poverty and the advancement of a country have heavily influenced his mind and his memory, made him conscious of living in a certain period of history, of belonging to a persecuted people and to share them ideal as survival, solidarity, and peace, to be realized as the fundamental values of civilization. His existential route was extremely articulate, distinguished by his decision to devote himself to art as a profession that brought him from time in turn, to express his “Neofuturismo” not only in Europe but also in the United States and Israel. Schinasi has always sought in his art a dynamic depiction of reality, a narrative view positive and substantial dialogue since it expresses a faith in life future but not now dictated by an instinctive wish to reaffirm the values lost. His positivity is stated precisely by the “light” and “brightness” of his paintings, from the decomposition of space and time, speed and simultaneity that led clearly to oppose the extremes of Cubism and Futurism, thanks to the great Renaissance humanist school-that allowed him to keep intact the image of man, nature, and things, and to create a dynamic work without resorting to deformation “monstrous” image. Since 1970 he is the author of large murals that decorate and ennoble in several places in the world, environments of everyday routine as stations, prisons, airports, hospitals as well as shrines, racetracks, universities and opera houses. In the picture of his murals, the man and his reality are returned in all of its forms and its feel, not at all distorted by the technology of modern industrial civilization, a reflection of this position in clear disagreement Schinasi humanistic currents contemporary (not rationalism, primitive, nihilism ….). His artistic vocation was thus marked from childhood by the bitter experience of war and exile to Europe and all his creative work seems increasingly intense participation in the events of the story that accompanied the painful existence of his contemporary Jews over the past fifty years. His works continue to report that this was the past that should not be forgotten, not only honored but above all, to monitor and combat because “the Jew” is a man among men, with his dignity, his freedom and the common values of mankind. Is it not as a sign of perseverance that we may locate the implementation of Daniel Schinasi? It seems to apply themselves to rectitude where the differences are still a way to clarify the integrity of its decision. From 1960 to 1995, in a space of 35 years, reads an analogy of the same determination. The world around him rocking, Cubism, Futurism had ceased. Their place is now the Museum and he goes, monolith, giving to see the human face in its basic textures. The waves of abstraction, the cult of the object, minimalism and unfurl Schinasi begets a kind of message humanist. It’s a rock. Analyzing opens Schinasi through a given point in its history, a self-portrait (1956) to large murals of the 80s, is not it obstructs a permanent discourse, say and repeat that has to Schinasi to a need, with a melee that is the truth of humanity, its morphology moving in space. It develops and opens a considerable number of the pieces performed admittedly, but still more by his research on the authenticity of the individual. In a moment of our civilization where the real “stops” to have an ontological existence, Schinasi, a specific stimulation of our sensibility and our understanding of art, makes a refund of existence. One might conclude by writing that as the Greek sophist, it shows the movement, not by words but by walking.